Homeowners insurance agent, BMCC Insurance, offers tips for residents at risk of wildfire damage. With wildfires raging in numerous states, homeowners insurance agent, BMCC Insurance in California, reminds residents in, at-risk wildfire areas, that there actions they can take to help protect their homes. As a passage from the Ventura County Wildfire Action Plan says, “it’s not if, but when the next major wildfire will occur.” They are a natural part of life in the western U.S. With this in mind, here are some things that residents who live in an at-risk wildfire area, can do. First and foremost, have a plan. 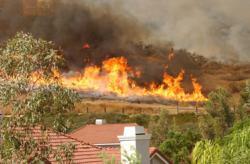 What will you do if your home is in the path of a wildfire? Stay and defend or leave? If the fire strikes suddenly, do you have a plan to gather your family and escape to safety? When you leave, where will you go? You should know the answer to all of these questions and more. Here is a link to the Ventura County Action Plan which presents a thorough plan for residents in wildfire areas, as well as an action plan to follow in the event of fire. Have you thought about the plants around your home? Some are more fire resistant than others. It makes great sense to surround your home with foliage that will help slow a fire if one should strike. Agaves are a prime example of a plant that not only looks great, but acts as a fire-retardant. Here is an article from Sunset Magazine that provides great tips for fire-resistant landscaping. BMCC Insurance represents many A-rated insurance companies and is licensed in 48 states. The company has hired personal and commercial insurance agents, customer service representatives and other support staff to not only handle the current level of business, but to be ready for the anticipated growth, in order to provide the best customer experience possible. BMCC is a multi-line insurance agency selling and servicing the consumer sector. Areas of specialty include auto, homeowner’s and life. BMCC Insurance is located in Encino, California.